Following Bordeaux Métropole’s commission of a fountain-sculpture installation – which will be unveiled next Autumn – Clémence van Lunen presents a new set of her works at the Galerie Polaris with the themes she’s been working on for several years now: flowers, butterflies and bowls. Using materials found in the streets of Chengdu (capital of the province of Sichuan) or in Paris, she features in this new series called « Fountain » the industrial ceramic matter as abstract stems. Those lines of bowls represent for the artist a way to respond with a exhilarating wink to Marcel Duchamp’s under-estimated sens of humour. In this new series, bricks and bowls discuss and merge together under the energetic hands of the artist, as if she wanted to build a baroque piece. If Clémence van Lunen short circuits the different kinds of materials in sculpture history, she also tends to perpetually question her previous pieces by kneading them like a « troubled kid » (as she pleases to say) to to give them a second life in a different shape. This kneading creates a brand new radicallity. The result is like a schematization between previous and news shapes : butterflies, flowers and vases newly shaped as bowls. Clémence van Lunen succeeds in keeping the identity of the bricks, while pushing the spectator to question himself on the reality of the kneading. We also recognize in these new shapes some references to the Art Nouveau (which was itself inspired by Egyptian art) and to monumental sculpture. 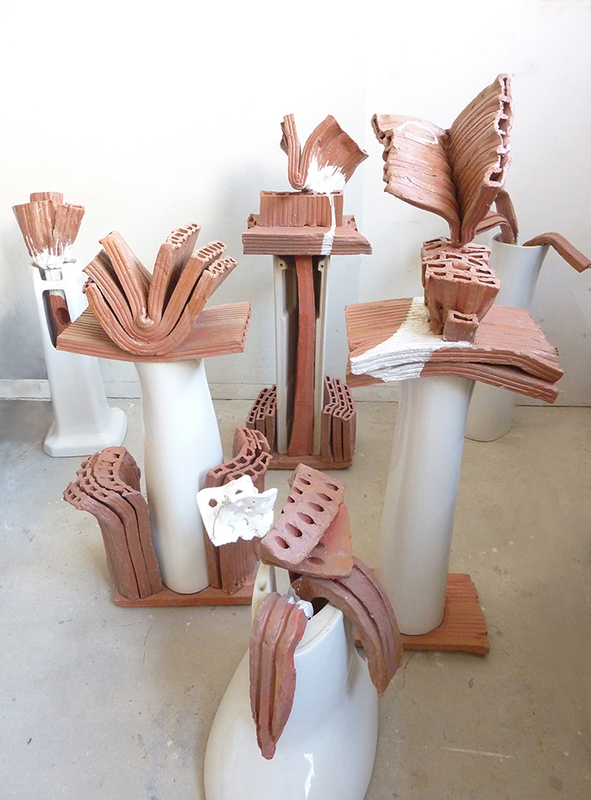 But, by playing with the holes in the hollow bricks, Clémence van Lunen empties the pieces of their statuary origins that she both mocks and claims at the same time, in a back and forth mouvement between the origins, the history and the contemporaneity of ceramic. As Frédéric Bodet wrote in the catalogue of the artist’s exhibition at the Domaine de Kerguéhennec: « she tends towards an art of vitality ». And if a suspicion of irreverence crosses our minds, Clémence van Lunen responds with her work that she continuously nourishes with questions, without giving answers.